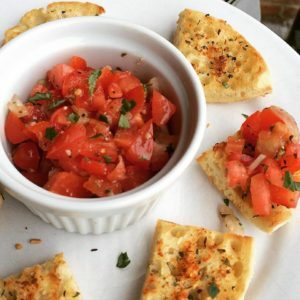 Olive, Red Pepper Bruschetta | Get In The Kitchen | Cooking. While. Awesome. Italian spice Blend or create a blend of equal parts basil, dry minced garlic, parsley flakes with a pinch of red pepper flakes. Finely chop tomatoes and place in a bowl. Chop a ½ of an onion (or 1 shallot) finely and add to bowl. Chop 3 sprigs of parsley and add to bowl. Add the roasted red peppers and olives. Add 2 tbsp of olive oil, 2 tbsp of red wine vinegar, and 1/2 tbsp of balsamic vinegar. Add 1/2 tsp of pepper, ½ tsp of salt, 1 tbsp of parmesan cheese, and 1 tbsp Italian Blend or substitute spices. Add two cloves of pressed fresh garlic, mix thoroughly and refrigerate for an hour. Make your own bread or make garlic bread by slicing french bread into pieces and arrange on a baking sheet. Sprinkle with parmesan cheese, garlic powder, and ground black pepper. Put in oven at 300 degrees until toasted. Serve the bread on a platter. The bruschetta can be served in the bowl so your friends and family can dish it out themselves.